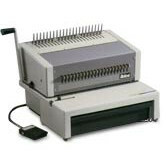 Comb Binding is one of the most common mechanical binding systems. It is a simple, inexpensive yet versatile way to bind your documents. Books bound with plastic combs use round plastic combs (or plastic spines) that are inserted through rectangular holes punched in the document. Combs are then chosen to match the spine size of the document. Combs are relatively sturdy, although they will need to be protected from damage if you are going to send your document through the mail. They can easily be opened to insert new pages if you need to update your document. Books cannot be opened 360°, so choose a different method (such as plastic coil) if you need that feature. Combs are most commonly used to bind books printed on Letter or A4 paper, but they can be easily cut to fit any size paper from about 3.5 inches up. Just about any type of paper that can be printed on can be bound. 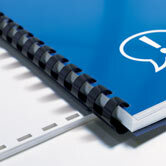 Clear, solid, or window Binding Covers are most commonly used to keep the pages from being damaged. 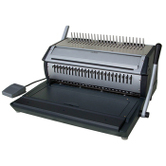 You will need a Comb Binding Machine such as those offered by GBC Binding to punch the rectangular holes in your paper and covers and to hold the combs open to insert pages. 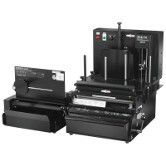 These features are commonly found on a single machine, but some types designed for production use do only punching or only binding. You will need one of each if your binding volume is high enough that you need to separate these operations. Plastic combs are sometimes called spiral combs or spiral bindings. These terms are also used to refer to plastic coil, so be certain you have the right type before ordering. See our tutorial page for more information on the difference between these two binding methods. 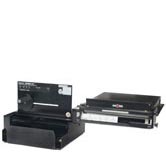 We are pleased to offer some of the top brands in comb binding machines, including GBC binding. 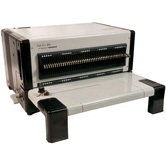 Browse our great selection of comb binding machines including the popular GBC Binding / Ibico EPK 21 Plastic Comb Binding Machine. 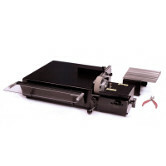 We also offer a large selection of Laminating Machines, Paper Cutters, Coil Binding Machines, and Tape Binding Machines. 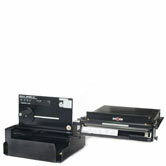 Consult with our knowledgeable staff if there is a particular GBC binding machine or Ibico binding product you require. 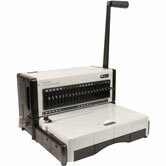 The GBC CombBind C75 is a small light duty comb binding machine It's perfect for Home & Small Office use. 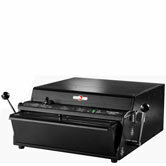 It punches up to 10 sheets of 20 lb. paper at one time and can bind up to a 125 sheet book which is about 7/16" thick and would use a 9/16" Comb to bind it. You can punch letter (8 1/2" x 11) and A4 (8.3" × 11.7") sized documents. 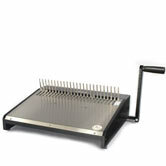 The PBPro 101 Comb Binding Machine is an affordable easy to use comb book maker thats great for any small office. 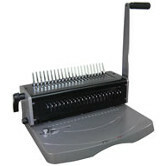 It punches up to 12 sheets of 20 lb paper and can open combs up to 3/4" creating a 210 page comb bound book. 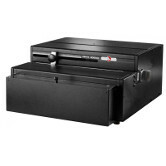 It has an adjustable margin that allows you to comb punch 11" or 8 1/2". Affordable manual punch and bind for plastic comb binding. 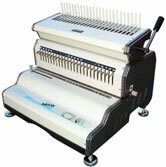 Heavy Duty flexible easy to use comb punch & bind. 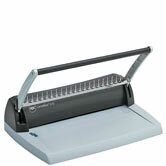 The PbPro 200 Plastic Comb binding machine offer a heavy duty punch capacity at an affordable price. 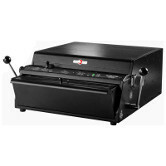 The PBPro 200 can punch up to 20 sheets of 20lb paper. 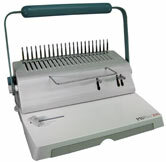 The PBPro 201 is a heavy duty plastic comb binding machine built to last modeled after the industry standard. 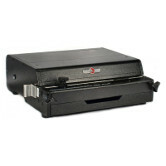 It punches up to 20 sheets and has 21 disengageable punch pins for different size documents. 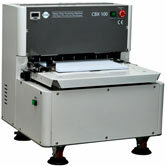 The GBC C800 Pro is a heavy duty electric plastic comb punch and bind machine. 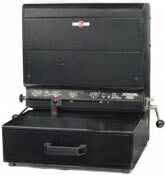 The GBC Pro is modeled after the industry standard EPK 21 and is made to last with full metal construction. 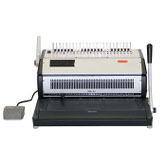 The PBPro 301 Plastic Comb Binding Machine has an electric comb punch that punches up to 20 sheets of 20lb paper at a push of a button. 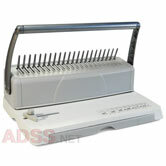 It has an integrated easy to use comb spreader to make it an all in one comb book binding solution. 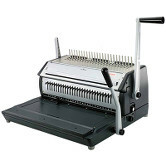 With its heavy duty punch motor and complete system of functions, the CombMac-24E makes comb binding fast, easy, convenient and professional, making it the ideal partner for commercial volume workloads. 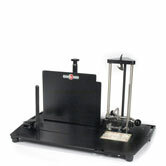 The HD4470 comb opener will open comb elements from ¼ inch to 2 inch. 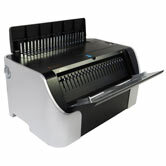 The HD4470 can open up to 21 element combs for documents up to 14 inches long. 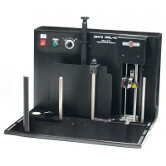 The HD4470 will mount on any vertical Rhin-O-Tuff OD or HD punch (optional mounting kit available). 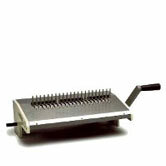 The HD4470 comb opener will open comb elements from ¼ inch to 2 inch. 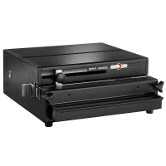 The HD4470 can open up to 21 element combs for documents up to 14 inches long.